As part of my ongoing research into MVVM architecture, databinding, RxJava 2, and Dagger 2 on Android, I built a small Android app that utilizes the Guild Wars 2 API (https://wiki.guildwars2.com/wiki/API:Main). Right now, there’s only a few API responses being utilized as part of this project, but it has been useful for understanding more about MVVM, RxJava 2, and Dagger 2. Overengineered? Yes. A work in progress? Definitely. 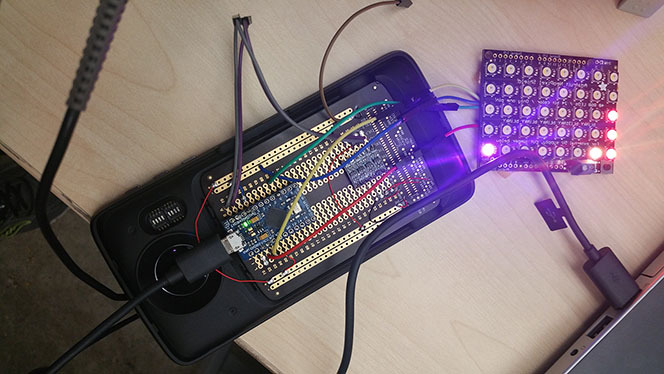 In the course of 24 hours, here is results of our Android/Arduino hack at the Motorola Mod the Future hackathon, THEMLights! THEMLights is a LED module that displays pixel art, as well as acting as a visualizer for any song playing in the background. A new update for Dragon Geo has been released! With this new update (1.15), there are some rather big updates. – Labels for Dream World and Real World maps for Dragon Quest VI [DS] added. – Added map support for Dragon Quest V-VI [Android/iOS]. – Ocean animation added for overworld maps in Dragon Quest IV/V/VI/VII. – Music pack feature is now built-in as part of the app. – Additional battle background images have been added. – Added the ability to zoom in further on maps. I’ve just released a new version of GO THERE NOW, an Android app that allows users to launch Google Maps’ Navigation Mode quickly in a single step. GO THERE NOW has been completely re-designed from the ground up and now employs a Material Design-like style. Along with the UI change, GO THERE NOW now allows users to manage favorite location shortcuts. In addition, GO THERE NOW fully supports Android Wear; users can launch navigation mode directly from their Android Wear devices. – Application completely re-designed from the ground up; now utilizes a Material Design-compliant style. – Location shortcuts can now be saved within the application; can launch navigation mode by tapping on the saved location shortcuts. – Full Android Wear support! All location shortcuts are synchronized with paired Android Wear smartwatches. – Can launch navigation mode on smartphone or tablets from paired Android Wear smartwatches. If starting Navigation Mode in Google Maps frustrates you, check out GO THERE NOW; it may save you some time! Many thanks goes to CronoSpeaks over at Reddit for sharing Chrono Maps with the /r/chronotrigger sub-reddit! After several months in active development, GPOP Labs is proud to announce that StepBOT 1.0 is now available on the Google Play Store! SeaNav US posted in the Pebble developer forums, stating that their recent iOS update was declined. The reason? Support for Pebble smartwatches in the app. We noticed that your app or its metadata contains irrelevant platform information in the app. Providing future platform compatibility plans, or other platform references, is not appropriate for the App Store. Specifically, your app and app description declare support for thePebble Smartwatch. Please remove any instances of this information from your app and its marketing materials, including the Application Description, What’s New info, Previews and screenshots. NOTE: Please be sure to make any metadata changes to all App Localizations by selecting each specific localization and making appropriate changes. With the Apple Watch coming out, Apple apparently is now banning iOS apps that have Pebble support. While I don’t own a Pebble Smartwatch, I do know several people that do, with iPhones. Simply put, this is an apalling move of Apple; Pebble has to be concerned about supporting iOS now. Apple has backtracked on this issue, now claiming it ‘accidentally rejected’ apps with Pebble support. In any case, iOS users with Pebble watches can relax, for now. Still a work-in-progress, but we’re working with Apple to clear up any misunderstandings to make sure rejections like the handful of recent ones don’t happen again—they’re being super responsive the concerns that bubbled up (much appreciated!). Apps are still getting approved with mentions of Pebble support in the description or metadata (e.g. RunKeeper). For now, developers should continue with their iOS app update plans and approval submissions to the iTunes store as normal (i.e. include Pebble support in your app info if that was your original intent). HuhX Game Sound Engine Now Open-Source! I have recently open-sourced the music/sound engine that I created for StepBOT, Dragon Geo, Cid’s Aerial Tours, and Chrono Maps. It is available on GitHub and is freely available to those developing audio-related apps for the Android Platform. The HuhX Game Sound Engine is a custom game audio engine for Android 2.3 – Android 5.1. This is an easy-to-use sound and music engine that is focused on providing audio for Android game-related apps. This audio engine was utilized in apps such as StepBOT, Dragon Geo, Cid’s Aerial Tours, and Chrono Maps. The demo activity provided with the project provides an example how the HuhX GSE engine works. Define your song and sound effect names and resources in HXGSEMusicList and HXGSESoundList classes. Declare HXGSEMusicEngine / HXGSESoundHander objects as universal variables. Initialize HXGSEMusic / HXGSESound objects in the onCreate() function of the first activity / fragment of your app that requires sound playback. Status of the music and sound engines will be outputted to logcat. Once fully initialized, all methods of HXGSEMusicEngine and HXGSESoundHandler are available to use. INITIALIZATION: Intialize the HXGSEMusicEngine / HXGSESoundHander objects once, in the first activity of your app that requires sound playback. No need to re-initialize these objects in other activity instances (unless releaseAudio()/releaseMedia() is called, which is not recommended until the end of app life), as a single instance is active until releaseAudio()/releaseMedia() is called. Initializing HXGSEMusicEngine / HXGSESoundHandler more than once may result in more than one audio streams running at once. ANDROID API 1 – 11: HXGSESoundHandler class creates multiple instances of HXGSESoundEngine, based on the second parameter inputted for the initializeAudio method. This is to help minimize the SoundPool out of memory issue that is present in older versions of Android. As a suggestion to help minimize the issue, make sure that loaded sound effects are small in size and bitrate (recommended to be less than 100 KB and 64kbps or less). Please note that for devices running Android API 12 or greater, only a single instance of HXGSESoundEngine is used, as the 1 MB sound buffer limit issue is not present on newer versions of Android. RELEASE: It is recommended not to call releaseAudio()/releaseMedia() in HXGSESoundHandler and HXGSEMusicEngine unless your application is about to be terminated. If releaseAudio()/releaseMedia() is called and sound or music functionality is needed after such calls have been made, a new instance of HXGSESoundHandler / HXGSEMusicEngine must be initialized before audio is able to function. SCREEN ORIENTATION CHANGE: If your application makes use of screen orientation changes, it is important not to call the releaseAudio()/releaseMedia() methods in HXGSESoundHandler and HXGSEMusicEngine in onPause()/onStop()/onDestroy() states. It is highly suggested to make your activity to use the following property in the AndroidManifest.xml file and make use of the onConfigurationChanged() function. – New gate to the El Nido Archipelago has appeared. Chrono Cross maps are now available for viewing! – OPTIONS: Crew dialog shown when tapping on Epoch. – OPTIONS: Pressing the MENU key returns the user to the map view. – OPTIONS: Pressing the SEARCH key displays the TRIGGER menu or causes a dimensional CROSS. – CREDITS: Spekkio now appears in CREDITS. – FIX: Resolved an audio issue on devices running Android 2.3 (GINGERBREAD) where the sound effects would stop playing.